Regulator Ofcom has issued a warning to the BBC suggesting that the Canvas IPTV project could hamper fair competition in the broadcasting industry. 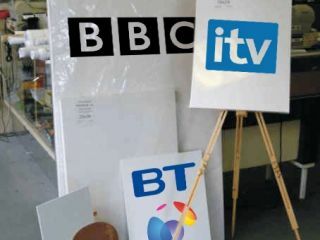 Project Canvas is a joint initiative between the BBC, ITV and BT to develop a common standard and interface for delivery of online catch-up services such as BBC's own iPlayer to broadband-connected set-top boxes. It now seems like Canvas "may be facing the same kind of regulatory scrutiny that led to the demise of Project Kangaroo, the joint VOD venture between the BBC, ITV and Channel 4" reports InteractiveTVtoday. Ofcom's Peter Phillips claims, in a recent letter to the BBC Trust, that "there may be a future role for the OFT [Office of Fair Trading] and/or Ofcom to assess [Project Canvas] under relevant merger or competition law." The letter continues: "We understand that the technical specification for Canvas will involve not only reference to open standards, but also identifying preferred technical solutions from specific vendors. "The latter may have associated intellectual property rights (such as the chosen Digital Rights Management system) which could inhibit their use by third parties outside the Canvas consortium or potentially reduce competition. Encouraging effective collaboration between Canvas and third parties already developing fully open standards in these areas is likely to be beneficial for consumers." Ofcom admits that "while the benefits of Canvas are potentially significant" that "it is important that commercially led propositions which seek to compete with Canvas should not be unfairly prevented from accessing BBC content." Grant Rennell, Deputy Editor on What Satellite and Digital TV magazine, adds: "If Project Canvas gets approval, it'll usher in a set of standards for producing a new breed of affordable boxes capable of getting the best free TV has to offer, both live and on-demand. "This can only be a good thing for confused consumers left wondering which set-top box offers the best value."